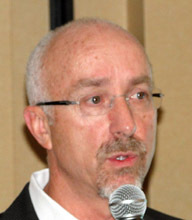 Paul joined Coinstar in April 2008 as Chief Operating Officer and became Chief Executive Officer in April 2009. Throughout his career, Paul has held various sales and executive management positions, including CEO of Kettle Foods, President of Starbucks North America and President of PepsiCo’s Frito-Lay Company in Canada. In May, it was announced that Paul was ranked fourth by Fortune Magazine on its Fortune 500 list of Technology Visionaries. Paul is recognized among an esteemed list of Fortune 500 business leaders for his success in expanding the Redbox self-service movie and video game rental business from an innovative young company to an industry leader in movie rentals. Paul Davis, CEO of Coinstar, described the company as a leading provider of automated retail solutions offering convenient services that make life easier for consumers and drive incremental traffic and revenue for retailers. We bid farewell to Farina, our exchange student as she heads home to Germany. Scott Sadler pumped us up for our upcoming BBRC Charity Golf Classic. SAA Tim Johnstone charged Ann Norman a Flat Tax of $10 for receiving the Volunteer of the Year award from WSCPA. Bob Holert introduced our speaker, Paul Davis, CEO of Coinstar. The title of Paul’s presentation is Success through Innovation. Paul started by giving us a brief overview of Coinstar which is headquartered in Bellevue and celebrated its 20th anniversary last year. Coinstar is a leading provider of automated retail solutions offering convenient services that make life easier for consumers and drive incremental traffic and revenue for retailers. The company’s core automated retail businesses include the well-known Redbox self-service DVD and video game rental and Coinstar self-service coin-counting brands. The company has approximately 36,800 Redbox DVD kiosks and 20,200 coin-counting kiosks in supermarkets, drug stores, mass merchants, financial institutions, convenience stores, and restaurants. Coinstar’s mission is to reimagine retail in new and unexpected ways. Coinstar has annual revenue of $1.8 billion, a market cap of $2.1 billion and 2,700 employees. Redbox started as an experiment with McDonald’s in 2002. Today, there are 36,800 Redbox kiosks located at leading grocery stores, mass merchants, drug stores, restaurants, and convenience stores. Approximately 68% of Americans live within a five-minute drive of a Redbox kiosk. Redbox offers a convenient rent-and-return anywhere policy and has rented over 2 billion discs to date. Redbox has 4.7 million Facebook fans. On February 6, Redbox announced a joint venture with Verizon. The venture’s services will offer all of the convenience, simplicity and value of Redbox new release DVD and Blu-ray Disc rentals combined with a new content-rich video on-demand streaming and download service from Verizon. Chris Monger called the meeting to order at 7:30am. Tim Johnstone, our new Sergeant-at-Arms, followed by proposing a bet: Were there under four or over four BBRC members who showed up at Glendale Country Club instead of the Sheraton for this morning’s meeting? Later in the meeting, Tim told us there were three BBRC members who showed up at Glendale Country Club. Those who guessed wrong had to put $1 on the table. In all you do be positive. A number of governmental agencies use Mason’s Rules of Order. Under Mason’s you cannot make a negative motion! Kick back and relax. And allow your partner to do the same! Think about how lucky you are. You live in the greatest nation on earth and belong to the Bellevue Breakfast Rotary Club! Dispense with the superstitious nonsense and take responsibility for the things that happen to you. If you can’t “deal with it”, whatever “it” is try a little faith in the deity; Allah, Buddha, God or Yahweh. Chris Ballard followed and introduced visiting Rotarians and guests. Ann Norman announced that our lovely exchange student, Farina, would be leaving for Germany tomorrow. Farina came up to the front of the room dressed in a jacket with pins of all the places she had visited during her stay here; both the front and back of her jacket were covered. Is there anywhere Farina hasn’t been? Farina thanked her three host families, Rourke O’Brien & Sayoko Kuwahara; Morris & Carolyn Kremen; and Mike Ralph. She mentioned that she had become addicted to sushi and particularly enjoyed the Western Safari program. The BBRC will be hosting an exchange student from Finland this year and Ann is currently looking for host families that live in the Bellevue High School District. Scott Sadler thanked all the sponsors individually for their contribution to the BBRC Charity Golf Classic and Ruben Ladlad encouraged everybody to do business with our sponsors. There are currently 104 players signed up and Ruben is looking for 20 more players. He is also looking for additional volunteers. Kit Bowerman announced that 11 items for the silent auction have been donated and he is looking for more. Kit reminded us all to bring a bottle of our favorite beer to the meeting next week; the BBRC beer collection will be yet another item for the silent auction. Given that the BBRC Charity Golf Classic will be held on July 23, there will be no meeting on Friday, July 27. Tim Johnstone asked Ann Norman to come to the front of the room. Tim announced that Ann Norman received the Volunteer of the Year award from the Washington Society for Certified Public Accountants (WSCPA) for her work as Chair of the WSCPA Taxation Committee. Ann was charged a “flat tax” of $10 for the recognition she received. Katherine De Stephano announced the new Sponsor of the Month program where one BBRC member per month would pay $160 to sponsor the BBRC donation of 1000 pounds of produce given to Northwest Harvest in the name of the speaker at our Friday morning meeting. It took Katherine all of two minutes to line up sponsors for the next 12 months. Katherine’s company, Escape Outdoors, is the sponsor for July. Howard Johnson announced that the BBRC exceeded its targets for Rotary First Harvest. We exceeded $8,000 in contributions in the past year and 277 volunteers participated in the Rotary First Harvest work parties. 1. John Martinka recently submitted the grant application for the Computers for the World project in Antigua. 2. Chuck Kimbrough asked members who have friends who are members of private golf clubs to find out if their golf club would be willing to donate a round of golf to the BBRC Charity Golf Classic silent auction.